Mamaroo: I had heard that some babies really don't like the Mamaroo, but Beau LOVES his. One morning when we arrived back at the NICU, one of our favorite nurses had put a Mamaroo in Beau's area and he was already loving it! It was so nice to have something consistent for him when he got home and he still loves it. We often let him nap in it without it even on (silly, I know) but if he's extra fussy or needs to be occupied while I do something he loves it during the day. Aden and Anais Blankets: We don't actually swaddle with these, but I love them for when Beau is riding in the carseat or sitting in the mamaroo, they also work well as a carseat cover and tummy time on the go! A few times I've even used them to cover my whole body when feeding Beau a bottle in the back of the car to prevent spills on my clothes. LOVE them! Aden and Anais Burpy Bib (two pack, here): I had no intention of getting hooked on $10 burp cloths. We have a ton of cheap ones and while they get the job done, I kept reaching for the one burpy bib we had been gifted. They are huge, and knowing I can easily clip one around Beau's neck is SO nice. They're wonderful and worth every penny. I bought two more during Beau's first week at home and will put one in every baby gift I ever give in the future! KickeePants: the softest, comfiest jammies and onesies.. you can find them at boutiques but I think the cheapest and easiest place is from Amazon. Nose Frieda: Trust me, you need this. It sounds gross but it's not at all and your baby will have boogers and you just need to get them. 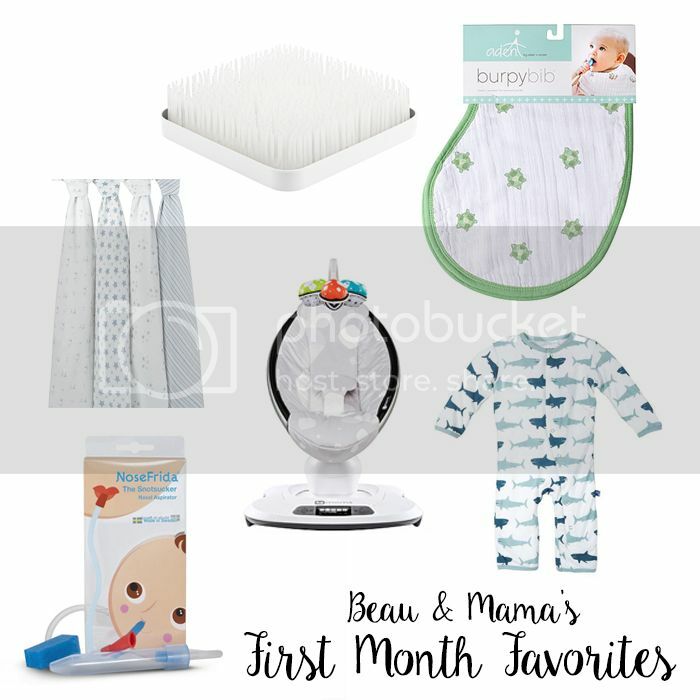 Before actually having Beau in front of me I hadn't really processed that boogers would keep your baby from breathing easily.. this is just something that was so awesome to have ready for us to use without even thinking about it. Any recommendations on things that we should try during his second month? We have that drying rack and I love it. I didn't think it was something I would need until we actually needed it! haha! Also the Nosefrida has saved us countless times. We still use it two year later!